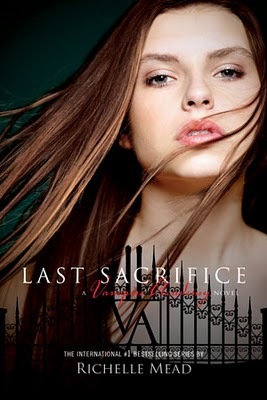 I'd So Rather Be Reading: Last Sacrifice Teaser! What can it mean? Is it Rose, Lissa, or who speaking?? It could be Rose because Richelle mentions that there will be a cameo appearance of Rose in the new VA series coming out summer/fall 2011. Historically the first chapter gets posted prior to the release date. We will anxiously keep checking Richelle's VA site for the post. Here is the new UK trailer for the entire VA series (it shows the new covers for the series). This and Harry Potter are like the two most anticipated things to look forward to this winter !!!! ahhhhh! I can't wait for this one! I'm so nervous, and extremely excited, and also sad that it's ending:( I'm happy to see she's doing a spinoff in the same world, so we won't be losing this series completely. This title makes me so nervous, please don't die Rose or Dimitri. Please. Ooooo cool! I didn't know! Oh MY GOSH Melissa! Go IMMEDIATELY and get them! I will warn you I was not in love after book 1 but book 2 and on HOOKED! Oh Melissa... If I were in SLC visiting family I would meet you at a coffee shop and force the books on you! Traditionally, Rose has narrated all four previous books. So, if Mead keeps to tradition, it's Rose speaking. And if Rose is speaking at the end, then we know she doesn't die---YAY!!! I need to read this series. I have the first 3 books on my shelf, I just haven't been able to get to them. Everybody just raves about this series. I have a feeling I'm missing out.